Can You Change The World of One Animal? FCVC supports World Animal Day, as the primary goal of this ongoing mission is to raise the status of animals in order to improve standards for their welfare around the globe. This is a lofty goal when it competes with sub-standard human conditions in many parts of the world. Share the hashtag – #WorldAnimalDay. Find out how you, too, can take a selfie promoting World Animal Day today, at the bottom of this post. World Animal Day was chosen to be on October 4th as it marks the death of Francis of Assisi, the patron saint of ecology, including animals. Francis of Assisi (1181-1226) was the founder of the Catholic Franciscan order. Legend has it that Saint Francis was able to talk to animals, which is why he is depicted in numerous paintings in their company. He would also preach to the animals and even tamed a wolf. He died on the eve of October 4th, which became his patron saints day. Assisi is a town in central Italy, north of Rome, only two hours from Florence where in 1931, 705 years after Francis’ death, World Animal Day was officially adopted. The idea of World Animal Day was originated by Heinrich Zimmermann, the German writer and publisher of the magazine Mensch und Hund/Man and Dog. He organized the first World Animal Day on 24 March 1925 in Berlin and moved it to 4 October for the first time in 1929. Initially he found a following only in Germany, Austria, Switzerland and Czechoslovakia. Every year Zimmermann worked tirelessly on the promotion of World Animal Day. Finally, in May 1931 at a congress of the world’s animal protection organizations in Florence Italy, his proposal to make 4 October World Animal Day universal, was unanimously accepted. To raise the status of animals in order to improve welfare standards around the globe. Building the celebration of World Animal Day unites the animal welfare movement, mobilizing it into a global force to make the world a better place for all animals. It’s celebrated in different ways in every country, irrespective of nationality, religion, faith or political ideology. Through increased awareness and education we can create a world where animals are always recognized as sentient beings and full regard is always paid to their welfare. To achieve this mission, we encourage animal welfare organizations, community groups, youth and children’s clubs, businesses and individuals to organize events in celebration of World Animal Day. Involvement is growing at an astonishing rate and it’s now widely accepted and celebrated in a variety of different ways in many countries, with no regard to nationality, religion, faith or political ideology. Events are organized under the World Animal Day Umbrella by being publicized on this website and advertised using the World Animal Day brand and logo. Global branding effectively ties all events together and, over the years we have found this approach to be particularly helpful to grass roots groups who struggle to attract media attention in order to raise awareness of their work and fund raise. This draws attention to animal issues and makes them front page news – a vital catalyst for change. Each year the logo becomes more widely recognized as a global brand for animals. A brand that unites the animal welfare movement – firmly establishing itself as a platform for raising the status of animals. Building the celebration of World Animal Day mobilizes people for action now for a better future for animals. Throughout history, social movements (mass actions) like World Animal Day, have always been a major vehicle for ordinary people’s participation in politics, and key in fighting for social justice and reform. The lives of animals are profoundly affected by the actions of individuals, businesses, and nations. It’s therefore essential that, as sentient beings, their rightful status as recipients of social justice is established and translated into effective animal protection. 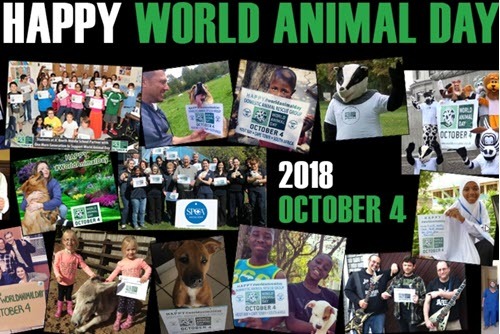 World Animal Day embraces all animals and the unique concerns of each, in every country, and makes animals front page news. Through increased awareness and education, we can help develop a compassionate culture which feeds into legal reform and social progress to make this world a fairer place for all living creatures.A world where animals are recognized as sentient beings and full regard is always paid to their welfare. Amina Abaza, who heads the Society for the Protection of Animal Rights in Egypt (SPARE), has used World Animal Day to successfully lobby for the addition of a clause about animal welfare in the new Egyptian Constitution and, more recently, submitted a Model Animal Welfare Act to the Egyptian Parliament. Another ground-breaking event achieved by SPARE was held at Cairo University’s Faculty of Veterinary Medicine where animals are used in education. Attended by professors, students, the Dean and Vice Dean of the Faculty, and other dignitaries, speeches were made by the President of the Egyptian Veterinary Association and representatives of several, highly-respected animal welfare NGOs to increase awareness about alternatives to the use of animals in education and a film was shown about animal suffering throughout the world. Both Animals Lebanon and AnimaNaturalis Colombia have achieved a Municipal Resolution that requires the Secretariats of the Environment and Civic Culture to commemorate World Animal Day each year, which is helping tremendously to raise awareness among citizens about the ethical treatment of animals. The Sudanese Animal Care & Environmental Organizations greatest achievement is the introduction of animal protection legislation by the Sudanese parliament. Much of the work to achieve this magnificent goal is attributed to increased awareness of animal welfare issues brought about by World Animal Day. There are other days linked to animals such as: World Day for Laboratory Animals on April 24th and World Wildlife Day on March 3rd, and these are important too. 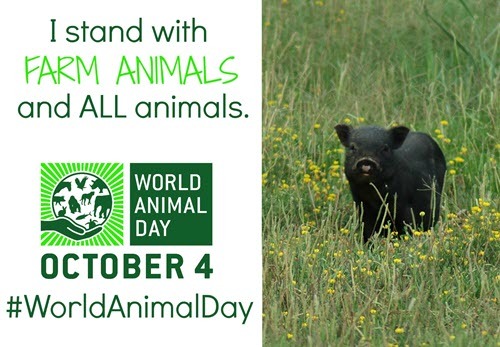 However, World Animal Day is the one day of the year that embraces all animals and the unique concerns of each, in every country. It’s a special opportunity to commemorate our love and respect for animals by doing something special to highlight their importance in the world. It unites the animal welfare movement, mobilizing it into a global force for change. Participation in celebrating World Animal Day grows each year, with a huge variety of inspiring events being held in an increasing number of countries. In 2003, we recorded 44 events being held in 13 countries and this has now grown to an estimated 1000 events in around 100 countries. YOU can help enhance the visibility of World Animal Day. Increased awareness, combined with better education for both adults and children, is slowly swaying the attitudes of people towards treating animals in a humane and compassionate way. Peaceful protest marches to either raise awareness of a specific animal welfare issue or to encourage governments to introduce animal protection legislation. 4. 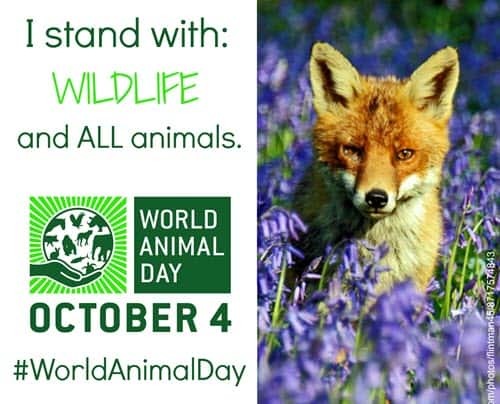 Email it to info@worldanimalday.org.uk for publication on their social media platforms. FCVC hopes you will be active in the simple measures of taking a selfie with the poster and sharing the hashtag. Happy #WorldAnimalDay ! Related articles that speak to animal awareness that you may like – Awareness: Adopt a Less Adoptable Pet Week and Deaf Dogs May Amaze You.